Now that Valentine’s Day is behind us, it’s the perfect time to chat about keeping love alive after baby. Personally, I hate to write things like this on Valentine’s Day -I feel like it holiday-ifies it (totally a made up word that I am going with). 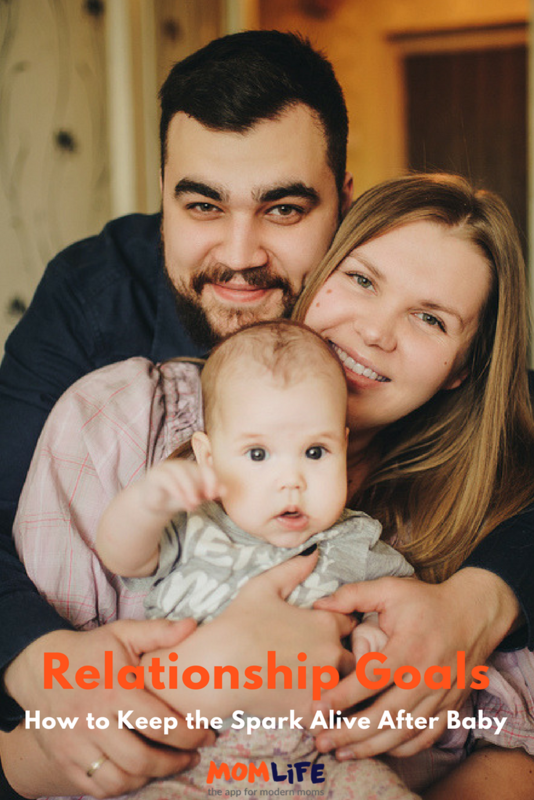 It makes connecting with your partner, showing you care, the effort of relationship maintenance, growth, and appreciation something you do once a year. When there is a greeting card to match. Deep down, even if we don’t have the energy to admit. We know that it requires constant effort, continuous dedication, time, and as little pettiness as your heart can muster. That said, we also know it can be hard. We all have relationship goals, but new baby, new body, new stress, new reason to just fall asleep come Friday night in the shower and sweats you’ve been rocking since Tuesday. The struggle is so very real. Maybe not over baby, but over say, laundry. Or, vacuuming. There are things in life that can wait until after the needs of the people in your life have been met. Put your partner in the same category as baby. So, just as you’d never make baby wait for your attention until after the laundry is done, don’t make your partner wait either. Many couples think they have to plan some big thing to reconnect, but truly, a date can be Netflix and, um, Netflix. Just the two of you and a pizza, together on the couch after the baby is tucked into bed. What you do isn’t as important as doing whatever it is together. Spending time with your partner shouldn’t be a chore, nor should it be solely about the kids. On a day to day basis, when connecting away from the kids can be challenging, make it a point to be positive and kind when it comes to talking to your SO. Compliment your partner, to ask them about something that’s important to them, and to share something with them that has nothing to do with the offspring you share. It’s easy to get caught up in talking about nothing but kid issues and to-do lists. Make it a point instead to say he smells good in the morning, to ask her about her workout, and to tell him about yours. Things like Face Time and texting can be a great way to connect with your partner when it’s hard to get that time together in person. During the week, my husband and I are rarely home and awake at the same time. And, when we are, our kids are all up in it and everything is chaotic. We’ve had some of our most productive conversations via text! We talk about important things, send each other funny videos, and even flirt. Now, it doesn’t take the place of sitting down and having a face to face from time to time, but it does allow us to stay connected with what is going on with each other while we are both working or away from home. And yes, you can get creative with it. It’s hard to want to make time for someone else when you don’t have time for yourself. Make sure you invest in you so you have time, energy, and desire to truly invest in others.